Out of this world images from Von Wong! Create - How to create the underwater image & which lights do you really need? (12:09) How to create the underwater image & which lights do you really need? Johny: Hey Guys, what’s up? It’s Johny here and welcome to another episode of the SIC show and as always I’m super pumped to here. And we’ve got a little cat. And we’ve got B man. How are you Brother? Johny: What’s the cat’s name? Yeah, it’s your cat not mine. Johny: I got a German shepherd, Man. And it’ll eat that thing. Brent: Okay, she’s going to jump. Johny: This week on the show, Brent interviews Benjamin Von Wong. And Ben’s got a little story about “Violin Von Wong”. Brent: And Ben’s going to inspire us with this amazing underwater model shipwrecked from Bali. Brent: And then we are going to talk about how he actually created it. And he shares his philosophy on artificial lighting which kit that you actually need to create these amazing images. Johny: Yeah, Man; perfect. Let’s get into it. Brent: Alright Ben, share something with us that not many people know about you. Ben: So, I’ve done over 10 years of violin lessons. I started when I was 5 years old. Wait, did I start earlier than that? Actually, I don’t remember when I started violin anymore. I think actually I started when I was 4. Regardless, my parents brought me to you know good Asian parents brought me somewhere and they’re like “Okay, you need to choose a musical instrument” and they thought we’re going to go with the piano but actually I wanted to play the violin. So, I did that for a pretty long time until I was about 15 or 16, I was playing in Orchestras. And then I just decided that it wasn’t getting me the girls like a guitar would. So, I just kind of just let it go. And that was the end of that. So, my violin career actually went off to a very, very strong start for the first three years. And then what happened was they moved to China and we lived in a hotel for a year and a half during which we had to change teachers and practice in the hotel and everything. So, my violin skills were went down and drained. And it was more or less kind of the thing like it just had to. Every weekend I was playing an orchestra. I got to a point of going to Germany to play an orchestra. And I pretty much haven’t really touched it. So, I used to play violin. Brent: Wow, so how long has it been since you last played? Ben: Well, recently when I was in Colorado just 2 months ago I was in someone’s house and had an electrical violin and they had some Suzuki playbooks which is the course material that I was learning. And I just picked it up and try it again. It’s really funny, it’s like your fingers are stupid. You know what it’s supposed to sound like but it doesn’t quite do what it’s supposed to. But it was fun. But I think it could come back one day I decide to cool things down and get some time to it. It is a nice skill to have. Brent: Yeah, I don’t think you ever going to cool things down Man. You’re on fire. Ben: We never know. We never know you could get solutions with the world. You could get tired of working all the time. You could try something new. Just skip back and go for the simple things. I think there are tons of different options. Ben: Inspire, so the image I’ve chosen is probably the photo that has been seen the most in my career which is this photo of a lady in an underwater shipwrecked with her dress floating along. And it looks like she’s walking along and bow the shipwrecked and these corals growing up in it. It looks so real. It looks Photoshop. The girl’s ghostly white but you just know she’s underwater. I guess the reason I chose to talk about is it’s just the one that’s garnered the most interest. 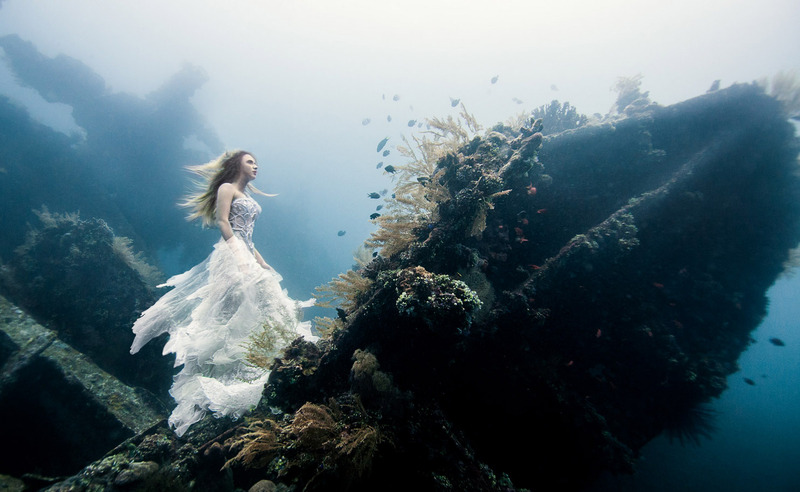 People seem always really excited about the idea that this was shot about 25 to 30 meters underwater in a shipwreck in Bali where we tied the girl under the water and took some photos of her in something that looks like a wedding dress. And the cool thing about the photo shoot itself is that there’s a video that proves that it’s all real. And I think that’s probably the reason why it’s kind of spread far and wide on the front page of everything from 9GAG to Imgur and all that stuff which is pretty fun. So yeah, it’s a one off. It’s really funny because I haven’t done that many underwater shoots. I’ve done maybe 3 so far. But it’s become one of those iconic ones where you know, people just recognize it until to the point of where I recently got hired to do an underwater shoot in Mexico. Brent: Wow, awesome. That’s a great image Ben. I love it. And I know how difficult it is to shoot underwater. I’ve photographed quite a few models underwater in the ocean and in the swimming pool. And I know how difficult it can be especially dealing with a model that needs to smile and open the eyes and pose and hold their breath. Look really weird going like that. Ben: Right, you can’t even talk to them. Brent: Yeah, you can’t talk to them. It’s great. So, you had divers come down and give her air, right or oxygen? Ben: Yeah, we were an entire crew of people. She had her own 2 safety divers would be looking out for her hand signals to see when she would need air. They would come over and give her air, pass with a mask. Someone was watching over me so I didn’t drift away into something because of the current. We had one guy being the overall supervisor and just making sure that everything is going okay. You know, we had some really interesting problems of the standard like you were saying; directing, posing, breathing, all that standard problems. And we had these weird problems like tourist floating into the shot trying to take selfies, you know underwater it just so happens and you can’t tell them to go away because they can’t hear you. They’re just floating into the shot. You have to take them and shove them off. And even if they got away the bubbles is kind of stand in the vicinity of the entire shot. So that was a little bit of a pain sometimes. But it was definitely a unique shoot and unique experience. Brent: So, just a couple of questions in this image. I know when I photographed underwater on models; I used a pretty wide angle lens because of the magnification factor when you’re underwater. And the further away you get from the model the worst the visibility. Let’s say you’ve got to be reasonably close with a wide angle lens and you get all these distortion in the edges that are even magnified or even worst. So, you’ve got to put them right in the middle. How did you deal with that? And what kind of setup did you use? Ben: So, I was going to use a Nikon AW1 which for those of you who don’t know is more of like a consumer level camera. I drowned it the day before my shoot. I think I just ask someone else for a camera. And the camera that I found was a Nikon D90. So, I just Nikon D90. I think it was an aquatic housing and I was just like “Yeah, let’s just go ahead and shoot with this.” I have the option to use the Canon 5D Mark II. But someone else was shooting video with it and I was just “Anyway, I can do it with a Nikon. That’s not going to be a problem.” I kind of regret it ultimately in retrospect because of how amazing the shot turned out, I should’ve probably used like a D810 or something. A D800 I think at that time was all that existed and tried to do the best shots as possible. But you know, one of the things that I really enjoy about photography is the ability to share with others and show them how it’s possible and you don’t need amazing equipment to make it happen because we had no flashes. We had no underwater lights, no nothing. And I still managed to make a cool product out of it. And yes, if you look closely the edges aren’t particularly sharp. We’re using a crop sensor lens but no one cares. The shots are nice on their own. And so, even if you do zoom in and the resolution isn’t quite there. We’re looking at 12 megapixels, fairly noisy, shot underwater. You know, you can see particles in the water and stuff. But no one cares. Because it till makes you dream because photography is more than just about the pixels. It’s about the emotions that it’s able to generate. Brent: Yeah, definitely. And I think it’s also the vision. The vision that you bring to this shoot, you know. I know you’re an amazing photographer with amazing visionary and you come up with these ideas. You figured it out how to do it with the technology that we’ve got available. So, with this shoot, was this a commercial shoot? Was it something like you came up with? Like how did it all come together? Ben: Actually, this was a personal shoot that happens while I was on vacation in Bali. And my parents dragged me on vacation much to my displeasure. After I figure that I was going to be stuck on vacation, I thought it would be good to learn a new skill and so why not scuba diving and while reaching out to people on the internet. One of my fans with the name of Cassandra dragged in. She told me that she had a friend there that would love to meet me and he’ll probably help me set whatever I wanted to set up and so I said, “Great, so let’s organize a shoot.” I met him for the first day on Saturday. Explain to him the idea of getting models and dresses and makeup and everything. And you know, 4 days later I was shooting. I didn’t have a dive lesson yet. I didn’t have a diving certification yet. So I get 3 days of dive lessons and 2 days of shooting and I was flying out. So, that was my vacation. Brent: Wow, so how do you come up with the concept and how do you challenge yourself, you know? This is obviously a big challenge; something that you’ve never done before. Maybe you’ve seen images somewhere and you’re like “Hey, let’s give this a try.” You know, what goes through your mind to actually do this and spend so much energy and effort on this one photoshoot? Ben: I don’t think I spent more energy on this one than I did on any other one. It actually happens so quickly that it was more of a question of “Do I do something?” or “Do I do nothing?” It was just a fun thing to try. I mean I don’t just sit in my bathtub and come up with amazing ideas. I go out and talk to people and use the resources I have available in order to create the best project that I possibly can. And that always depends on what’s available. In this case, you know, it just so happens that the dive master that was helping me set up the shoot, his wife is an underwater model and she knew a designer that had piece white dresses that were lying around in his warehouse and so I didn’t have a vision of white dresses and I said “We need white dresses”. I did have a plan B in case we didn’t find a designer. We actually brought some sheets from the hotel room and tore them up and made dresses out of them. We had a plan B but you know, I kind of wanted to do a shoot regardless of what happen and so I went with the idea that I was trying to get as much as possible in order to make it happen. And things just unfolded the way it did. I would’ve loved to have more than 2 models but I had only 2 shops. One of which flew all the way from Dubai the day before the shoot just to be a part of the shoot. She flew herself. That was a great opportunity and great experience. And the other girl flew from Jakarta, I think. So I just had people paying their own dollar to com and participate in something and to have a unique experience. My videographer flew himself from Singapore. And you know this whole shoot was only confirmed pretty much a day before it actually happens because we didn’t know if we’re going to manage together everything in time. So, we did what we could and what we had available and this one turned out to be a great gamble and others that aren’t so great; never show up. So it’s fine or people don’t remember it. They don’t think about it. So, it’s not a problem. Brent: Awesome, well, thanks for sharing that and inspiring us with that amazing image, Ben. Ben: So, the topic I’m going to talk about is lighting. For a couple of reasons, one I think lighting is extremely important in order to make your images unique because once you control the light, you control how you image looks and then from there the post production or something to add on. But it starts with great lighting. And there’s a whole bunch of different ways around lighting. You can be really good on natural light and that’s fine but I don’t think that’s a reason to discount artificial lighting because at the end of the day they are just tools in your tool kit. And it’s important to understand as much as possible so you can decide from that point to whether or not you want to use it. And in the process of learning about this, you kind of figure that there is so much to buy, so many different variations and so many different options but it almost complicate you. Your life becomes complicated and so anyone who’s kind of start in this environmental portraiture out usually gets quite caught of what they have or what they don’t have. And use that as a kind of excuse to not be creative in images. So I own a 2 Broncolor move packs, four heads, and power 133, some soft boxes. So you’re talking about you know $25,000 of lighting and so the cream of the crop of lighting. But if you look at my images on my site and you try to figure out which images are shot with a Broncolor and which one are shot with a speed light, which one are shot with no lights, whatsoever. You probably pretty hard press to figure that out. And so, I guess the point that I’m trying to get to is that lighting at the end of the day is something that’s extremely fluid and flexible. And rather than think about what you need to create something, figure out how to create whatever it is that you want to create using what you have available. Because there are so many different remixes and options in order to get the effect that you want and of course there’s a certain minimum. You have to start somewhere, so you need to own some flashes but I’ve seen absolutely phenomenal things accomplished with only speedlights. And you worked with constraints that you’re offered. So, you have flashes that don’t give you much power. You get a little more restricted in the conditions in which you can shoot. So, the idea behind having extremely expensive light is that they increase your probability of having a very successful photo shoot. But that by all means shouldn’t actually dictate whether or not you’d be able to create in the first place. And so, I guess one piece of advice in terms of figuring out how to light your images up; one of the things that I have figured out to be the most practical solution is do not think about it too much. If you start mixing ratios, directions, modifiers and you start getting really, really caught up and all the technicalities of it and just start looking at diagram after diagram. It gets really tedious. I mean, I know there are a lot of dudes out there; the techie guys would really love it. But the problem with only thinking about lighting setup or a setup is that you kind of loose a shot that you’re trying to create on the process. So, rather than think about it, think about lighting as just a guide to follow. Look at it more as a tool to tell a story. So, what is the mood? What is the character thinking of? What is the environment you’re trying to create and why is there a character popping out? How are they popping out? And that would define how you light it. And if it sounds really complicated, if you’re lighting your thing and it just doesn’t look great, then just move your lights. You don’t need to know exactly what’s going to happen if you move it 20 centimeters right, left, up, down. You just do it. And you have a viewfinder on the back or you just check it out. Take a shot, look at it and then you can figure out really quickly what looks good, what doesn’t look good. There are simple tips that come along the way. If you don’t know which direction to make your model look, for the lighting to look good, a really good way to do that is you just have them look straight up to the light. You know, the lighting will fall over their faces and looks really good. If you want your images to pop out, if you want your character to pop out of the background, put a little bit of a backlight, put a little bit of separation. It doesn’t matter how close, how far whether it’s 90 degrees, 60 degrees, 30 degrees or 45 up. Others are just details or technicalities and you will learn them with time. You will learn them when you practice. You won’t learn them by reading up on other people’s blogs. You won’t learn them by just trying to memorize setups and everything. So, I think really the best thing that you can do is get out there and don’t about it too much. Don’t get too caught up. Don’t get too worried about it. So, I guess that’s kind of summarizes my view of artificial light. It’s a tool. You don’t need to think about it. It’s too complicated. You can see right away whether it works or not. And then from there you can create the image that you have in your mind. Assuming you mastered it. Brent: That’s awesome. Thank you, Ben. That’s great. And I follow your same philosophy. I follow on the philosophy of “Just do it and do what you can with what you got” and I think that kind of sums it up. Thank you. You have so much information. That’s great. Ben: I hope I didn’t just “blah” there and wander off. Brent: Oh, I love it. I love it, Man. We speak the same language. Brent: Awesome, thanks for being on the show. And I’ll catch you later.